Dutch prisons are emptying fast. The number of prisoners in the Netherlands fell from 20,463 in 2006 to 10,102 in 2016. This is equal to about 59 prisoners per 100,000 population, according to data from the World Prison Brief. In comparison, the United States, which has the world’s highest incarceration rate, has 666 prisoners per 100,000 population, or a total of more than 2.1 million inmates. The Netherland’s low incarceration rates are largely thanks to relaxed drug laws, a focus on rehabilitation and an electronic ankle monitor system. These measures have resulted in the closure of multiple prisons across the country in recent years, including Bijlmerbajes in Amsterdam, which was shut down in 2016. The site is scheduled to be demolished and converted into housing this year, but in the meantime it has been transformed into a creative hub called Lola Lik, which includes space for start-ups, a language school and a coffee shop. Lola Lik is also neighbour to the Wenckebachweg refugee centre, where up to 1,000 people are offered accommodation while seeking asylum. Guests arriving at the centre are encouraged to share their skills and learn new crafts. Alongside this project, the city of Amsterdam and various partners signed an agreement designed to help refugees secure employment opportunities. According to a report featured in Fast Company, this initiative reflects Amsterdam’s policy of actively fostering and encouraging activities aimed at the inclusion of refugees. Bijlmerbajes is just one of several prisons to undergo such a transformation. A report by NBC News highlights several empty prisons, including De Koepel in Haarlem, near Amsterdam, which has been converted into a temporary space for asylum-seekers. “We had to think twice about using prisons with (cell) doors,” Janet Helder, a board member with the Dutch government agency responsible for housing asylum seekers, told the Associated Press. Re-imagined spaces are also becoming increasingly common elsewhere. For example, Bayview Correctional Facility in New York City was recently converted into the Women’s Building, a dedicated space designed to help promote partnerships and create networks. According to a blog on the company’s website: “The Women’s Building stands for what’s possible when the potential of girls and women is nurtured, rather than locked away. 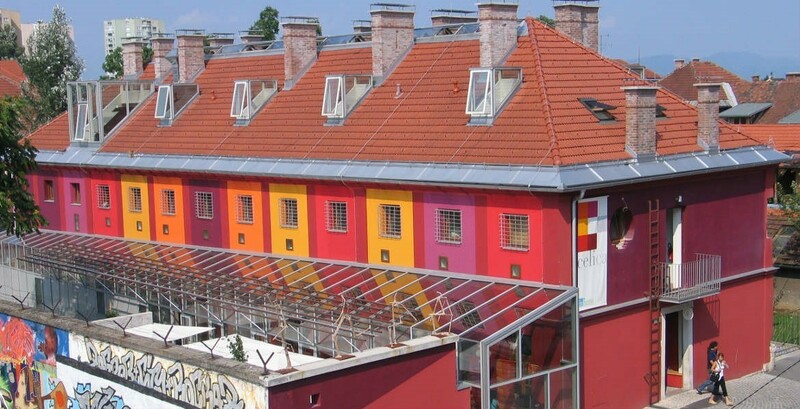 In Slovenia, meanwhile, a former Yugoslavian military prison was converted into a youth hostel in 2003, following a campaign by activists between 1993 and 2001 to renovate the space. The hostel’s owners says the prison was “artistically upgraded from a place of confinement into an open space, place of personal freedom and artistic expression”. While each room is unique, the hostel says they still have one thing in common: prison bars on the windows and doors. The Dutch leading the way, again. HBS Guy wrote: The Dutch leading the way, again. you wish ... the norweigns beat you to it. Puts a bit of a hole in the Europe as a tinted war zone with sky-rocketing crime story, doesn't it. At least one of them will spin it into prison cells being the best place for them. Holland has had guest workers since WWII, Italians then Turks. Also black Surinamers. Just shows you what a country can do if it chooses to reject the war on drugs. Which is after all the elephant in the room. The war on drugs is a money grab disguised as moral posturing. Was watching a doco based in the US once and the only way some small town police forces can upgrade their cars is by confiscating cars from drug runners. SO they look for a late model car they like, then pull it over and search for drugs. Do it enough times and sooner or later they'll find some drugs and get themselves a nice new car. As well as that most prisons in the US are privately owned. They receive a set amount per annum per prisoner from the govt. Take out all the druggies and jails stop making profits. I'm not suggesting they allow tons of cocaine in, but filling jails with users or the guys at the bottom of the pyramid is definitely not the solution. The drug problems can be easily addressed, cannabis should be legalised, non addictive party drugs should be available over the counter and are thousand of times less dangerous that just about every drug in the chemist. This using like ice, cocaine, smack and other addictive drugs, including prescription drugs, should be treated in rehabilitation centers, well away from society and if anyone commits a crims whilst using any drug, including alcohol ad tobacco, should have their sentence doubled. Those trafficking in these drugs, should be jailed for life with co chance of parole. If we made people responsible for their actions,m without being barbaric and giving them a chance to change, it would make a huge difference to the crime rate. I'd also execute anyone making or importing addictive drugs and especially ice, with no chance of appeal. You have to be extremely hard on the suppliers and tough but caring for users, then we would see an big drop in the crime rates and less jails. Dax wrote: I'd also execute anyone making or importing addictive drugs and especially ice, with no chance of appeal. punishing mules is pointless. They're usually just desperate people looking for easy money. he ones who should be executed are those that run the mules. Hilarious, that's exactly what my post says, however drug mules deserve what they get. If you're prepared to aid in the destruction of people lives, then you should be prepared to face the consequences and drug mules are wastes of space anyway. Not going to reply to anything you post from now one, I like intelligent conversations, not trolling ideological stupidity. If you like intelligent conversations you must really hate talking to yourself then. Your the idiot that wants to 'execute traffickers'. 'Traffickers' includes mules. Executing mules is a stupid suggestion that only a true cretin would suggest. Luckily for you, you fit that description nicely. Or we could legalise all drugs, like Portugal did and end the problem that way. Any use of police/courts means the continuation of the already–lost War on Drugs™. Holland has gone a long way down legalising drugs and that has been so successful that the prisons are empty. HBS Guy wrote: Or we could legalise all drugs, like Portugal did and end the problem that way. Any use of police/courts means the continuation of the already–lost War on Drugs™. Heavy Opioids and designer drugs like amphetamines, shouldn't be legalised, we are seeing to many occurrences of drug addicted morons out of control, attacking killing and maiming, to see these sorts of drugs are really dangerous for society. We could easily legalise lots of social drugs, but all that does is turn lots of people into addicts and a burden on society. Been down the drug path a bit, didn't interest me as it turns your mind the wrong way. Things like cannabis most definitely be legalised, just have to ensure people take responsibility for their actions, whilst on any drugs. The dutch have only legalise cannabis and they distinguish between soft and hard drugs, they tolerate some hard drug use, but are harsh on suppliers. It was only last your that they partially legalised the growing of cannabis. As I pointed out, soft drugs should be legal and those trafficking things like heavy opioids and amphetamines, should, be treated very harshly. Have seen the effects of amphetamine rages in a couple of our venues and it's not a nice or easy thing to combat, they go from being very nice and quiet, to raging violent bulls and almost unstoppable. That would be the best thing to do. Remove it entirely from police and courts, and treat it as the mental health issue it truly is. Getting the mussies ready for their future as rapists and terrorists. Too stupid to learn from france, belium and germany I suspect. Typical. Blame the woman. Original sin, innit. now ask yourself why you feel so guilty? how is this ? and then we have........ you should know by now......../// bigol never disappoints. Umm.. my... I'm getting used to ctrl shortcuts. Dandy. so hopefully you've understood my previous couple of posts. Umm No guilt, my friend.